Conversations among family and friends this week could include dying, hiding and finding "eggs." It is Easter you know. 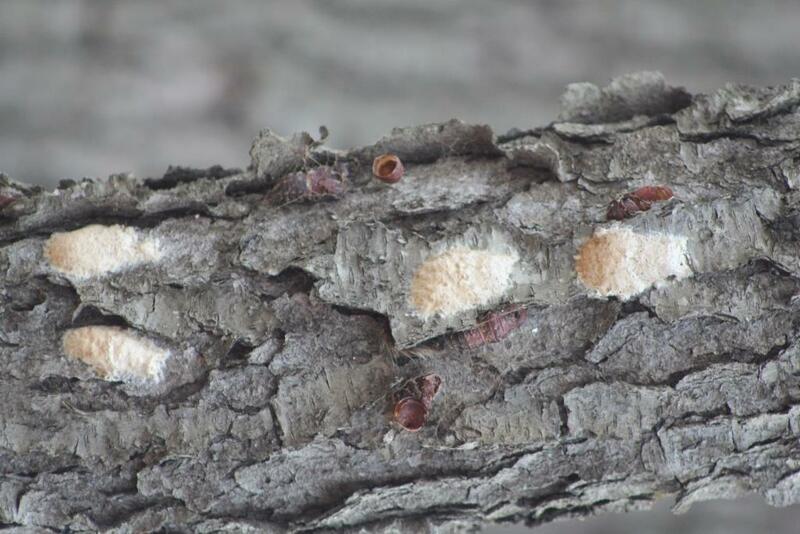 The eggs that we are talking about in this BYGL Alert are those of the gypsy moth (Lymantria dispar). After spending about nine months in the egg mass stage, warmer temperatures are triggering the hatch of the caterpillars in Ohio. These tan almost felt-like in appearance masses that can be laid anywhere will soon be bursting with 1st instar caterpillars. While we are eagerly awaiting the first hatch in NW Ohio, growing degree day (GDD) accumulations in southern and central Ohio indicate that if this exotic species is present, caterpillars should be observed. Egg hatch has been observed beginning at GDD 192. The first hatch of gypsy moth caterpillars is closely tied or correlated to the first bloom of the redbud (Cercis canadensis).